Two large tortoises range over the forest and savanna regions of northern and central South America east of the Andes. 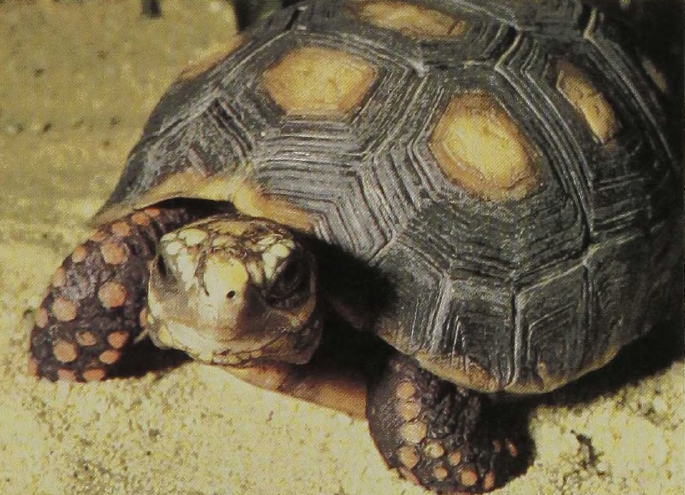 Until recently the two were confused, but it is now clear that the smaller Red-footed Tortoise occupies mostly the open savannas while the larger Jaboty (here illustrated) occupies forest localities. Interestingly enough, when confined in gardens the forest form will not bask in the sun, but hides.in the shade of low vegetation. The name Red-footed reflects the fact that young specimens have the scales of head and limbs colored a bright orange, which gradually becomes obscured as they mature. The forest form reaches a maximum shell length of 27 inches in eastern Peru, though specimens in other parts of the range are little more than a foot long.